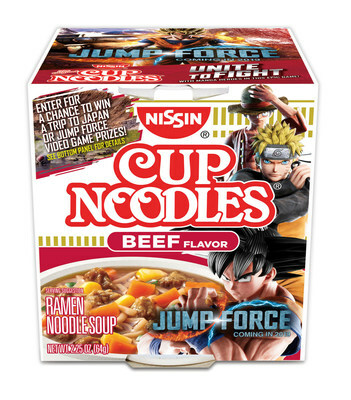 GARDENA, Calif., Jan. 14, 2019 — (PRNewswire) — Today, Nissin Cup Noodles announces its "Jump to Japan Sweepstakes" in partnership with the highly-anticipated video game JUMP FORCE from BANDAI NAMCO Entertainment America Inc. 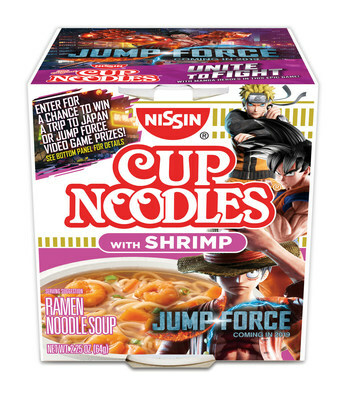 Fans across the nation will have the chance to win once-in-a-lifetime prizes through purchase of limited-edition Cup Noodles packaging, including an adventure-packed trip to Japan, copies of the JUMP FORCE game, and official Cup Noodles prizes. "Our brand fans already celebrate the natural connection between Cup Noodles and gaming," says Jaclyn Park, Cup Noodles Director of Marketing. "Our collaboration with BANDAI NAMCO Entertainment for the release of JUMP FORCE builds on this affinity and reaches out to the millions of manga fans who already see iconic characters such as Goku, Naruto and Luffy enjoying instant ra men in their respective manga." 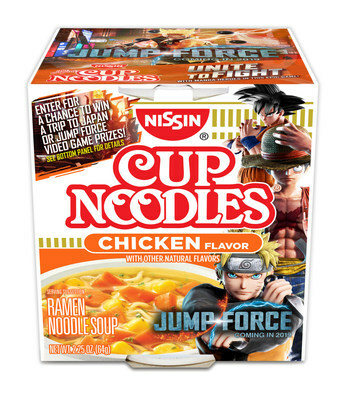 "JUMP FORCE celebrates 50-years of manga comics that have exploded into our pop culture and have become ubiquitous with video game fans around the world," said Stephen Akana, Brand Manager for BANDAI NAMCO Entertainment America Inc. "The 'Jump to Japan Sweepstakes' partnership with Nissin Cup Noodles will give our fans the chance to experience the unique and exciting culture of Japan, home of their favorite food and entertainment." Nissin Food Products Co. Ltd. was established in 1958 by Momofuku Ando, who invented the first instant ramen noodle in Japan. In 1970, they established Nissin Foods (USA) Co., Inc. in Gardena, California, introducing ramen noodles to U.S. consumers. In 1971, the company invented Cup Noodles, and revolutionized the industry by making it possible to package, prepare and serve noodles all in the same container. For 60 years, Nissin Foods has been providing consumers with quick and delicious meal solutions. In the U.S., Nissin Foods USA develops and markets a variety of products including Top Ramen®, Cup Noodles®, Cup Noodles Very Veggie™, Hot & Spicy, Chow Mein, Ramen Bowl, RAOH®, and Souper Meal®, uniquely positioning them to meet the needs of today's busy lifestyles. The company's corporate philosophy inspires commitment to taste, convenience and quality. BANDAI NAMCO Entertainment America Inc., part of BANDAI NAMCO Holdings Inc., is a leading global publisher and developer of interactive entertainment for all major video game consoles, iOS, Android, and online platforms. The company is known for creating and publishing many of the industry's top video game franchises including PAC-MAN®, GALAGA®, TEKKEN®, SOULCALIBUR®, and ACE COMBAT®. BANDAI NAMCO Entertainment America Inc. is the premier publisher in the Western hemisphere for anime-based video games including NARUTO SHIPPUDEN™, DRAGON BALL Z®, and ONE PIECE®. More information about the company and its products can be found at http://www.bandainamcoent.com or www.facebook.com/BandaiNamcoUS. JUMP FORCE celebrates the 50-year anniversary of Japan's influential Weekly Shonen Jump magazine by pitting its most popular franchises together including DRAGON BALL Z, ONE PIECE, NARUTO SHIPPUDEN, and many more in this electrifying area-based brawler. Company Name: Nissin Foods, BANDAI NAMCO Entertainment America Inc.